Forth is a computer programming language. Among other things Forth is stack-based, which makes it unique. (Well it's not entirely unique, just quite different from the usual languages like Java or C#.) It's not as popular as other programming systems and most likely you don't know it. I didn't know it either, but the interview with Charles H. Moore, its creator, sparked my interest. So I chose Forth as my new programming language for the last year. I use UltraEdit and love it. I created a wordfile for ANS compliant Forth. Adding a wordfile for syntax highlighting is simple. 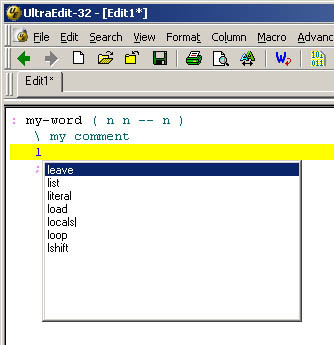 UltraEdit versions 14.20 and earlier use a different approach, but the wordfile is still compatible. 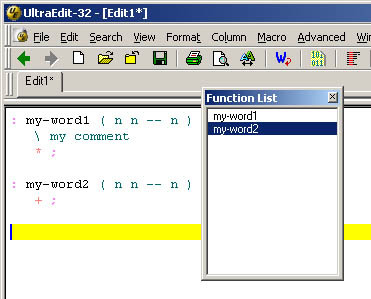 As soon as UltraEdit knows about the structure of a Forth program, it's able to provide code completion (shown on the screenshot on the right) and function lists showing all defined functions (see another screenshot). // is only a comment, if there is a blank or a newline before it, but the later is not possible to define in wordfiles. So line comments starting in the first column are not highlighted properly. UltraEdit supports only symmetric strings, e.g. character sequences between " and ". Forth sequences between S" or C" and " are somehow like strings, but in fact S" and C" are parsing words. These words are highlighted, but not recognised as the beginning of a string. So known words inside strings will be highlighted as well. There is no way to define the pattern for matching numbers and UltraEdit uses its internal magic. This causes some minor glitches in number formatting, e.g. with negative numbers. 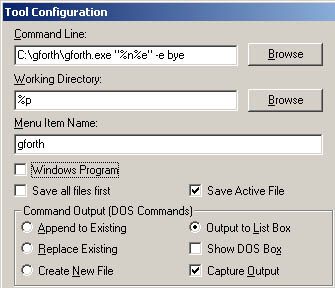 C:\gforth\gforth.exe C:\gforth\ans-report.fs "%n%e" -e "print-ans-report bye"